Magic Mushroom is a cross-platform, distributed network game, developed as solution to the OGO 2.3 assignment "NetConquer" (year 2006). In the game, players control a jumping mushroom in a colourful island setting. The goal of the game, trying to conquer as much areas as possible, is achieved by building flags at designated building points. 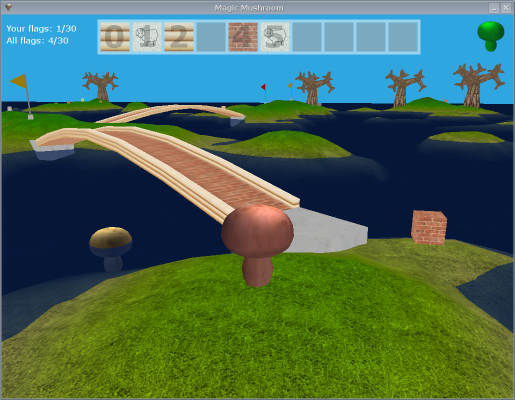 Players can cooperate in their schemes by helping each other build bridges in order to cross to other islands. Written by Jeroen Keiren, Thijs Nugteren, Carst Tankink, Pim Vullers and Freek van Walderveen, 2006. The program is available under the terms of the GNU General Public License. If you have any questions or problems regarding the application, please send an e-mail to magicmushroom@ this domain name.